Each vendor booth purchase includes two vendor badges. Any additional badges necessary for the event must be purchased in advance. We offer vendor badges at a discounted rate. Purchaser must use same name/ordering information when purchasing additional badges (not necessarily at the same time as purchasing vendor space). Additional badges may be purchased the day of the event, if needed, but at an increased rate. *Badge grants vendor entry into building one hour prior to event opening hours, and at noon on Friday, March 23rd, for set-up. 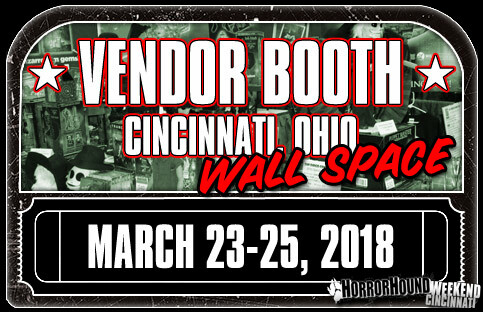 Vendor booth for HorrorHound Weekend: Cincinnati. March 23-25th, 2018. Includes a 6' table, two chairs and access to electrical outlets – located against a wall space. Includes two vendor badges. Additional vendor badges available at extra cost. *HorrorHound does not provide extension cords or any additional materials to aide in vendor set-up. Vendor agrees not to exceed standard 6x6' vendor booth space. Vendor agrees to sign emailed contract prior to event stating agreement to rules dictated on www.horrorhoundweekend.com vendor rules of participation. Booth is only guaranteed with receipted purchase of space from this web site. Location in vendor room is never guaranteed. Any questions? Contact weekend@horrorhound.com. 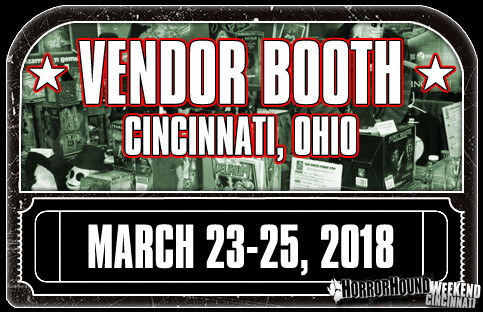 "Island-Style" Vendor booth for HorrorHound Weekend: Cincinnati. March 23-25th, 2018. Includes a 6' table, two chairs, and pipe/drape backdrop. Includes two vendor badges. Additional vendor badges available at extra cost. Electric for this style vendor booth is available at extra cost (see store for purchase information). If electric is needed and not pre-ordered, vendor must order electric direct from the convention center the day of the event at increased additional cost. *HorrorHound does not provide extension cords or any additional materials to aide in vendor set-up. Vendor agrees not to exceed standard 6x6' vendor booth space. 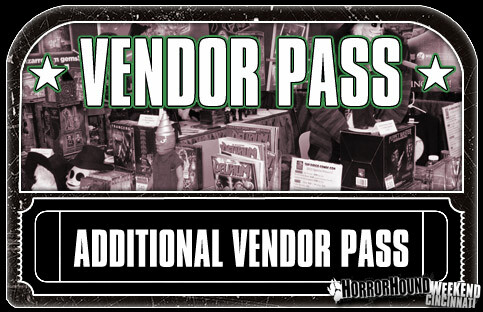 Vendor agrees to sign emailed contract prior to event stating agreement to rules dictated on www.horrorhoundweekend.com vendor rules of participation. Booth is only guaranteed with receipted purchase of space from this web site. Location in vendor room is never guaranteed. Any questions? Contact weekend@horrorhound.com.